I’m writing this while carrying my own weight on the downward slant of a broken commuter rail train seat. It’s late—a flat tire derailed my normal morning journey, and I’m headed to Boston on an unfamiliar train, with folks who are not just nameless, but who are also strangers with faces I’ve never seen. This train seems to be pushing faster, must faster than the rush hour train. So fast that I can’t balance myself in my seat, and my fingers cannot correctly tap out words. I’ll have to fix the typos later. I’ll be very late to work on this day, Friday, November 16th. My mind is wandering, thinking about the holidays, about how, like this train, they’ve rolled in far too quickly. But as usual, as I start writing about something on the train, I’m changing course. Distracted by the measures I go to in order to not be seen—well, read, actually. These petty topics and food-related thoughts that move me seem fine when thrown at the wall, or the web, but not when seen by those in close proximity. I sit next to far too many black-suited businessmen on my travels. Even if writing these posts is one of the best parts of my week, I fear that they’ll glance over at my screen, read my text, judge me, my importance. How freaking old am I? I sound like a child. But that lingering thought of, “Just because this is important to me, is it important, really?” always comes up when I’m in public, typing. Today is like any other day. I want to write about one thing, this thing. I get going. A passenger sits in the vacant space beside me, and I stop. I table it while it’s hot and try to pick it back up, recapture whatever emotion, reconsider my point, at a later time. It’s hard. Sometimes I’ll be the judger. I’ll decide a seatmate doesn’t look too “dangerous,” and I’ll continue—cautiously. I’ll shrink the font to 9, so I can barely read what I put down with these weak, lense-corrected eyes. I’ll adjust the “zoom” to 75%. It’s not great for these bad eyes, but it protects me from the wandering ones. I can carry on, but my words still feel inhibited. The rider beside me today is, I’d say, in his upper 30s, casually clad with knee-ripped jeans; a khaki fall coat; and a small, worn-out messenger’s bag—one a teenager would clutch. So, not too dangerous. Yep, I’m judging. I shrink my font, tilt my body slightly, and carry on. He stares straight ahead—so straight it’s as if his eyes are searching for contact with the passenger directly ahead. This one-way starring contest goes on for a while until he pulls out a pad. He flips through shamelessly, revealing sketches and half-sketches done in pencil and charcoal, each of a person, always a person. He finally finds a blank page somewhere near the middle, and his pencil hits the paper, his bent knee not only serving as an easel for his canvass but as a platform, revealing his work, his secrets, his drawn thoughts to me as I shield and hide mine from him. Although the man in front of him, listening to his IPod, will never know that his façade is now someone else’s possession, I know. He knows I know. And there’s nothing holding back the artist’s pencil. His strokes are smooth and confident. He’s comfortable with his creativity. I’ll never be as bold in my pursuits. I used to sing, publically. In any practice room I occupied, I’d cram into the corner that was farthest from the door. Alone in that room, I wanted to make sure that those who walked by could hear what was going on inside, even if they were going to hear it minutes later. So when I write something, I prefer to write in private, even if you are going to read it a couple days later. At that point, if it’s lame, well it’s just too late. But, inspired by the artist, I’ll do one thing shamelessly. I’ll post this roll recipe. 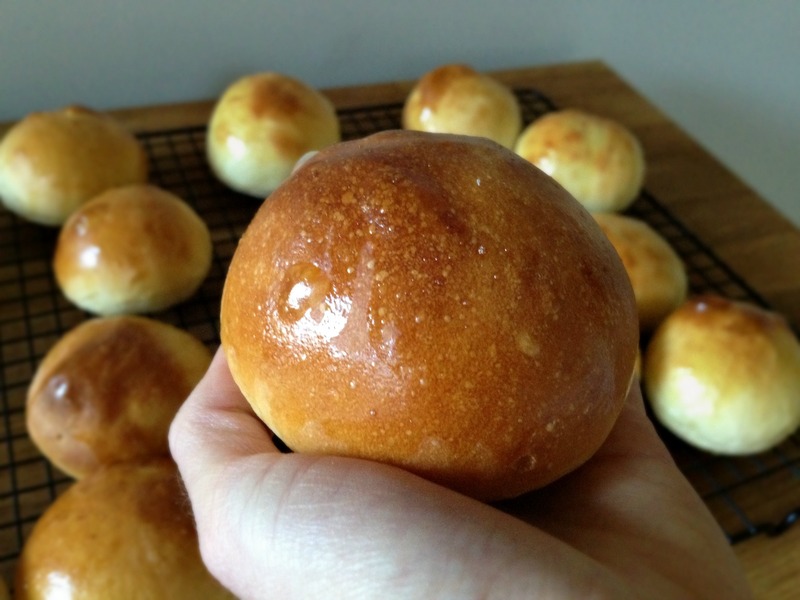 This humble, simple, white, plain ol’ dinner roll recipe. I never thought it would be post-worthy. I cook a lot of satisfying yet simple food, but this doesn’t even have hint of a bell, a dash of a whistle. It’s only slightly enriched, nothing like a brioche roll or a Parker House roll. It’s tender and fluffy and a little with a beautiful, gleaming surface, but it isn’t crunchy-crusted and open-crumbed like the rustic breads I usually turn to. But it’s comforting. It’s that roll your mom gave you as a toddler when your hand stretched out for something at the corner bakery counter—soft enough to be ripped in half with little hands but chewy enough to be satisfying, sweet enough to be interesting to little teeth. Basically, it’s the all-American dinner roll, and it’s exactly what I wanted this year at what will be a smaller Thanksgiving table. No sponge, no starter, no multiple-day wait. I love those things about bread-baking, but not this time. I didn’t want the normal bread I bake for the holidays; I wanted something simple, but something that begs to be eaten. Buttery enough on it’s own, and surprisingly tangy and smooth from buttermilk, these white rolls are delicious when slathered with more butter and used to swipe up rich turkey gravy. I made them this weekend to freeze for the big day, stealing two or three, and at the last minute, despite their simplicity, decided I would share them with you. Plain dinner roll or not. Fancy photos with cross sections and bowls of salted butter. No pie. No spiced, garnished side. No bird. No shame. adapted from Peter Reinhart. For the original recipe, see The Bread Baker’s Apprentice. Mix flour, sugar, yeast, and salt together in bowl of a stand mixer fitted with the paddle attachment on low speed until combined. With mixer running, add egg and butter, one piece at a time. Pour in buttermilk and mix until all flour is absorbed and dough forms ball, about 1 minute. (If dough seems stiff and dry, trickle in more buttermilk until dough is soft and supple. Switch to dough hook and knead dough on low speed, adding more flour (if necessary), 1 tablespoon at a time, to create dough that is soft, supple, and tacky but not sticky, 6 to 8 minutes. (Dough should clear the sides of the bowl but stick slightly to the bottom. Dough should register about 80 degrees F. Lightly spray large bowl with oil and transfer dough to bowl, rolling it to coat with oil. Cover bowl with plastic wrap. Line two baking sheets with parchment paper. Remove fermented dough from bowl and divide into eighteen 2-ounce pieces. * Cupping your hand and rolling pieces into the counter until smooth, round, and taut, shape pieces into rolls. Cover remaining dough with plastic as you work. Transfer rolls to prepared sheet, spray lightly with oil spray, and cover with plastic. Place oven racks in lower- and upper-middle positions and heat oven to 400 degrees. 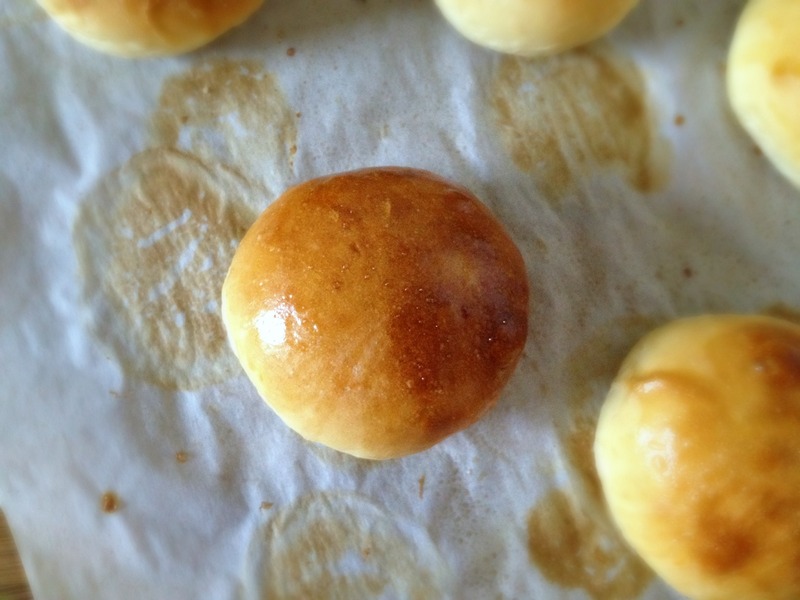 Proof the dough at room temperature for 1 to 1 1/2 hours or until rolls nearly double in size. Dough should feel pillowy and if you press on dough with a moistened finger, the hole should very slowly fill in about halfway. Whisk together egg and water until frothy. Remove plastic and brush rolls with egg wash. Bake until rolls are golden and register 180 degrees in centers, 10 to 15 minutes, quickly switching and rotating sheets three-quarters of the way through baking time. Transfer rolls to wire rack and let cool for at least 15 minutes before serving. 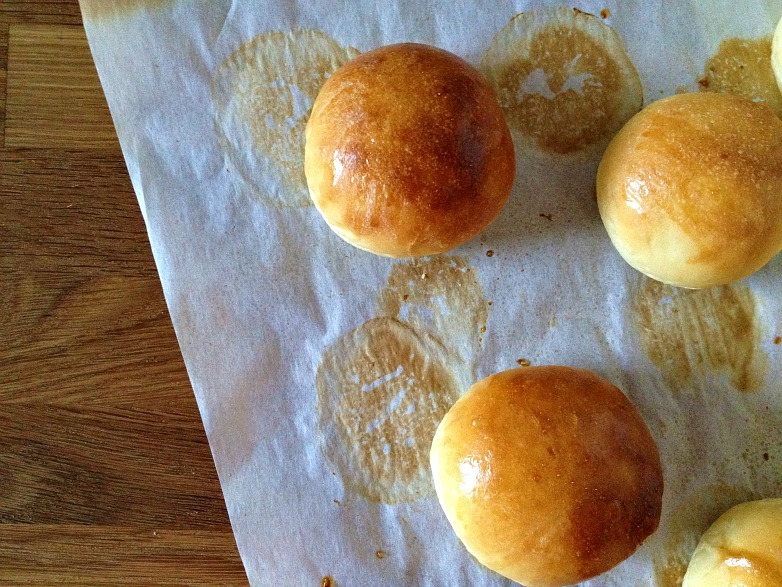 *These dinner rolls are a good size—people will love that. I prefer my rolls a little bit daintier and would probably make approximately 24 1 1/2-ounce dough balls, monitoring baking times accordingly. Sometimes the simplest recipes are best. I’m glad you posted these – they look wonderful. I never really thought about other people looking over my shoulder when I type in public (although I don’t take the commuter rail so public for me means Starbucks)… How cool that you were seated beside someone who was sketching another passenger! funny i was thinking about this on my commute home last night, when playing games on my phone i was wondering who else could see what i was doing :) these rolls look absolutely amazing! another note- if you’re interested in a boston blogger cookie swap shoot me an email and I’ll get you the details! 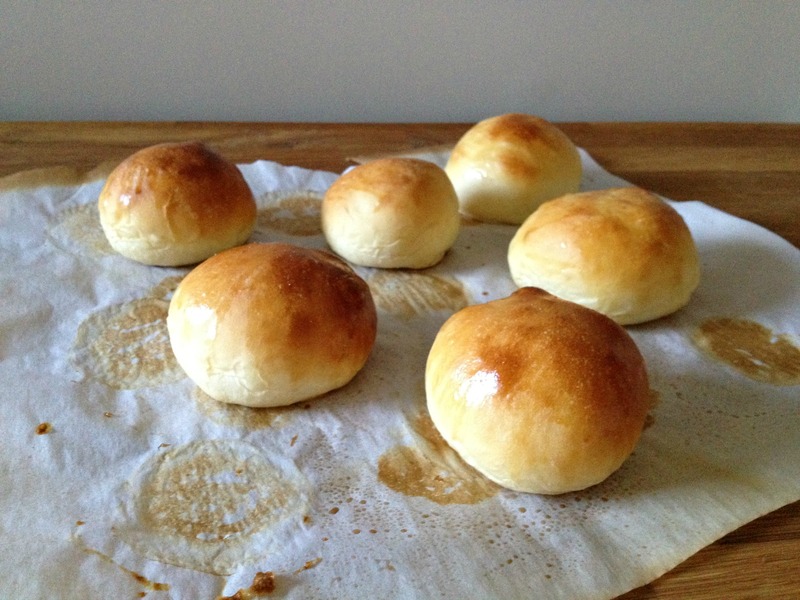 We’re having challah, but if we weren’t, I would definitely make these rolls. They sound so perfect. When I used to take the T regularly, I would observe other people… it’s interesting to see who holds their iPad or iPhone close and who holds it out for all to see… definitely different personalities at work. I love these cakes! they are so cute! I’ve never tested rolls, your recipe looks great! 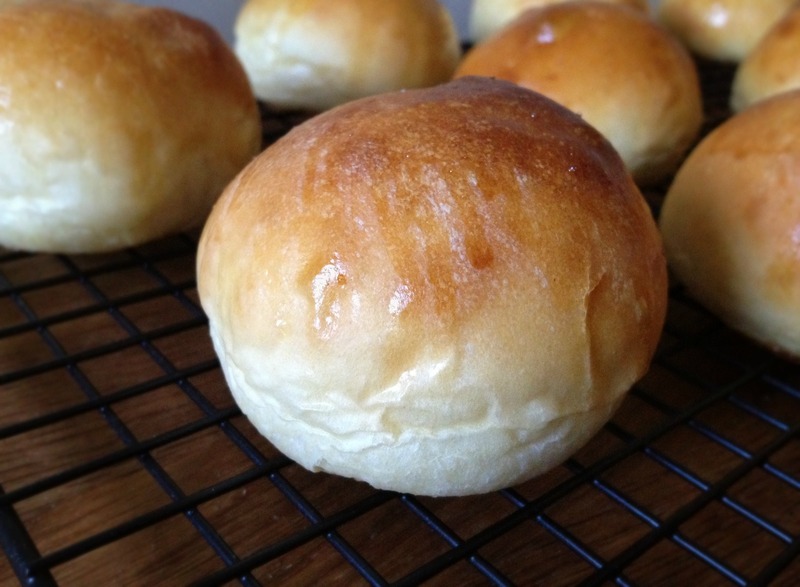 I just want to inform you, that this recipe has replace all previous dinner rolls! I have made it over 10 times in the last couple of months! thanks! That’s so great to hear. Thank you!